Please help me ID this bonsai "baby"
My first bonsai!!! I'm so happy, I've wanted one for so long! However the store had no tag on it, and it is growing very large leaves and loosing the little ones. So I need your help figuring out what tree this is so I can care for it adequately. Re: Please help me ID this bonsai "baby"
the foetida in the name means bad smelling. You can check if I am right by crushing a bit of the foliage and see if it has an odor. Welcome to the Forum and best wishes on starting your new hobby. 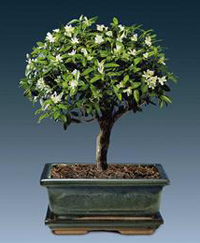 Do start doing some reading on the art of bonsai! PS. looking at your top picture, it looks like there's a layer of rock on top of the soil. If the rocks are glued down, you need to remove them. (Sometimes that requires chiseling them off.) They inhibit air and water circulation in the soil and make it hard to know when to water. You want to only water when the top part of the soil is dry (for an inch or so), which you can only know by sticking your finger or a wooden toothpick/ chopstick down in to it. Thank you so much for such a helpful reply. It definitely looks like Serissa Foetida, however I crushed one of the leaves (and a tiny bit of my soul while doing this ) and it didn't smell bad at all, but maybe I used a "too small" leaf. The rocks are loose but I have been worried about watering. It does drain well though.